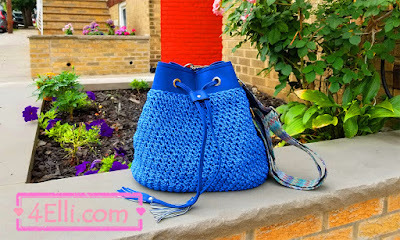 Materials: 12inh oval leather bottom (55 holes), a leather belt for bags, a handle with straps, cord, 4.25mm crochet hook. Make a slip knot, facing the right side of the bottom, start from the middle, place the knot into a hole and make a slip stitch, 2sc in each hole around. In the end you must have 110 stitches total. Round 1: 1sc into the 1st, 1dc into the same, *skip next, 1sc into the next, 1dc into the same*, repeat from * to * around. In the end your last stitch must be unworked, place a stitch marker into the last dc. Round 2: skip the last stitch of previous round, 1sc into the 1st sc, 1dc into the same sc, *skip next dc, 1sc into the next sc, 1dc into the same sc*. repeat from * to * around. Rounds 3-25: repeat round 2. In the end slip stitch to the 1st stitch, cut the yarn and finish your work. Watch my video tutorial witch shows you how to make this beautiful handbag and how to join the belt and the handle step by step! !